When dealing with the plethora of mobile platforms used throughout the enterprise brought on by BYOD, companies need help not only understanding what mobile devices are being used for business, but also how to enable mobility while ensuring that security policies are enforced. 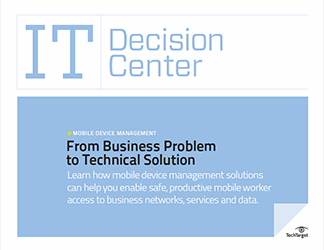 In this IT Decision Center, we’ll take you through the buying process for MDM solutions and explain how you can leverage those investments to get the most effective mobile security and data protection possible for your organization’s mobile workforce. Secure mobility within an enterprise isn’t possible without basic device management capabilities, and preferably more advanced functionality. Thus, MDM is rapidly moving from initial deployment to in-house maturity. In this fast-evolving market, it is essential to choose an MDM solution that can effectively manage present and future needs posed by increasingly large and diverse mobile workforces. Learn how mobile device management solutions can help you enable safe, productive mobile worker access to business networks, services and data. To properly evaluate mobile device management solutions, you must understand the diverse capabilities they offer, how well they meet your mobile workforce’s needs, and how they can be integrated into your environment. Evaluate your potential mobile device management solution and its ability to meet your mobile workforce’s specific business requirements.